Life can be strange at times. It can often seem that whenever we have our minds and hearts set on something, a million obstacles pop up to stop us from achieving our goals. When this happens, it can be disheartening, even if what's happened is completely out of our control. But in order to stop these things from happening at all, it can be in our own best interests to set actions in place to do so. After all, as the saying goes: fail to prepare and prepare to fail! An example of when something out of your control can affect your life is your health. Most of us have regular minor health ailments, right up to those of us who suffer debilitating conditions. But whatever your scenario, your health shouldn't stop you from enjoying yourself and living life to the full. Here's how you can learn to be prepared for whatever your health can throw at you, and why you shouldn't let it get in the way of your life again. If you've ever had a UTI or contracted cystitis, you will know how painful it can be. It is also one of those illnesses where you can be quite literally stuck indoors for days on end. It can also mean that you feel run-down, lethargic, and just generally a bit miserable! Once you know you have a UTI, the first thing you'll probably do is reach for the cranberry juice. This drink has been considered a cure for UTIs and cystitis for many years now and is the first port of call for most women who suffer from them regularly. This is because scientists have found that there is an active ingredient in cranberry juice which helps prevent the adherence of bacteria to the bladder. But, recent studies has thrown its effectiveness as a cure into question. Many experts now believe that it should be treated as a prevention, rather than a cure. So, with this in mind, it might be worth swapping your morning orange juice for a glass of the red stuff. Unless you're on a certain type of contraception, chances are you'll be getting your period every month. Of course, this is completely natural, so it's not anything to be concerned about. But a lot of women suffer from period pains so badly that it actually stops them from going about their daily lives. As the level of pain differs so much between different women, unfortunately it is not always considered to be a viable excuse to take time off work - even if you're doubled over in pain! If you know you get terrible cramps when your period is due, make sure you're prepared for it. Hot water bottles and heat patches can be a lifesaver for many women, and you may find it beneficial to take the occasional painkiller. If you want to stick to natural remedies, exposure to vitamin D and drinking chamomile tea are also said to help reduce menstruation pain. There also may be occasions when it is really impractical for you to have your period - such as a big sporting event you are taking part in. For these occasions, utovlan can be used to delay your period - so you'll be pain-free and able to get on with your day. 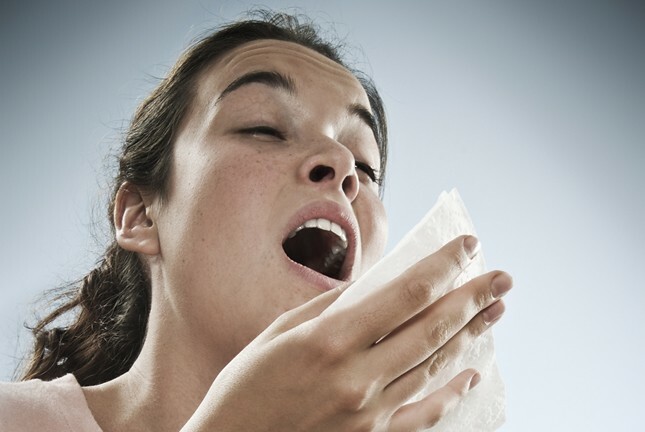 Most of us come down with between two and four colds every year. They are incredibly common and are the leading cause of missed school and work days. The reason we contract them so easily is simply because they are so contagious, and that we often live and work very closely with other people. It is caused by a virus which can be spread by touch, but it is also airborne. It is for this reason that it is difficult for most of us to know when we are at risk of catching a cold, and how we should avoid them. Having a bad cold or worse, one that turns into the flu, can be incredibly debilitating as it can often mean that you are out of work for a number of weeks. It can also make everyday activities such as cleaning and cooking difficult, as you will likely become sore and lethargic too. As with a UTI, actually curing a cold and flu once it has arrived can be very difficult. The viruses normally last around two weeks and in many cases, it's just a case of riding it out with rest and pain relief. But there are many things you can do to stop you contracting a virus in the first place. Practice good personal hygiene, especially washing your hands after coming into contact with other people or new places. Eating a healthy diet and getting plenty of sleep can also mean that your immune system is ready to fight off a virus, should you come into contact with one. Be sure to step up your health game during the winter, as serious viral conditions like norovirus are more common during this time.